Two weeks after a confidential extraordinary meeting of Kiama Council pulled the plug on the sale of its Akuna St/Mitre 10 site to Nick Daoud, the developer is still in shock over the decision. “It came completely out of the blue,” he says. He admits to being emotional when he was phoned by General Manager Kerry McMurray with the news. “I was just told “It’s over”. I said it can’t be over. We live in a lawful country, or words to that effect. “I have been unable to talk with Kerry or the Mayor since, despite approaches. “I feel what has happened is insulting and I want to be given the opportunity to hear why they have pulled the plug without any warning. Rather than threatening legal action, he says he just wanted to talk about the reasoning behind the decision. “I am a great believer in talking things over to work out problems,” he says. “I have never taken anyone to court, because I believe there are better ways to work things out. 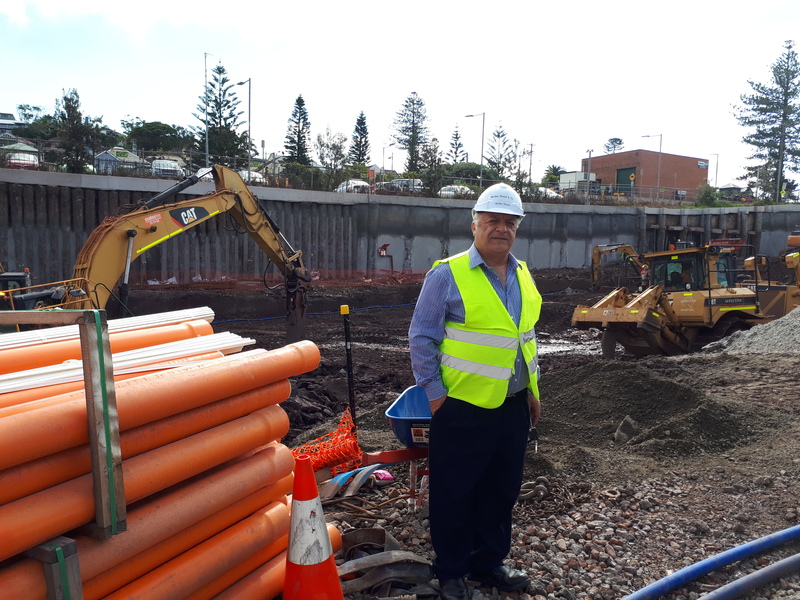 The developer says he has put two years of work into the project, to bring a second supermarket, connectivity between Terralong and Akuna St, and more apartments to Kiama. His total expenses are in the region of $2 million, including $550,000 in non-refundable option fees paid to Council. He has also bought adjacent properties in Collins St to facilitate access. Council has also invested a lot of time and money, and, according to Mr Daoud, the end was in sight. “The day before [Council’s decision to rescind], we were talking to planning officers about our amended design, which incorporates all of the changes recommended by the JRPP [Joint Regional Planning Panel, the body responsible for approving the development given its size and Council’s ownership]. “There was agreement on our design changes from Council and its advisors, apart from the planners having reservations about the suitability of a rooftop public access area on the site [as recommended by the JRPP]. At that time, Council had agreed to extend a final option to the developer (for another $60,000) so he could get approval from the JRPP by September. Mr Daoud says he was intending to present the plans to the JRPP at a meeting on 28 June, as he had been told the smaller proposal would not need to be exhibited again if the rooftop element was not included. Mr Daoud says he offered to exchange on the property after the last JRPP hearing, when time was becoming an issue, but then another option period was offered. He dismisses rumours that Aldi wasn’t committed to the project as being a possible reason for the reversal of the decision, which gained unanimous support from councillors. If by any chance Aldi did unexpectedly pull out, Mr Daoud had a back up plan signed with Metcash to provide an IGA on the site to meet the supermarket requirement of the contract. “Our contract with Council specified we had to have an Aldi, Metcash or Coles supermarket in the development. He rejects criticisms that the development was too big, saying the final design is 1100m2 under what is allowed by the floor space ratios for the site. Mayor Mark Honey says there is little he can say until councillors meet again to review the matter. He says it is not appropriate to meet with Mr Daoud at this stage. General Manager Kerry McMurray confirmed this position. Peter O’Neill of the Kiama Central Precinct, which opposed the scale of the development, is pleased that the site is going back to the drawing board. “Mr Daoud had three extensions but unfortunately the plans kept getting bigger, with more units and a cookie cutter design that did not acknowledge the character of Kiama,” he says. “The community now has the opportunity to work with the Council to design a development that will retain the 100 public car spaces that would have been lost, give us a decent sized supermarket and more commercial and retail space to provide local employment, and to build in solutions to traffic management problems. He sees the development of a new Kiama Town Plan (reported in our last issue) as the perfect opportunity to incorporate a revised Akuna St design into a larger town design. 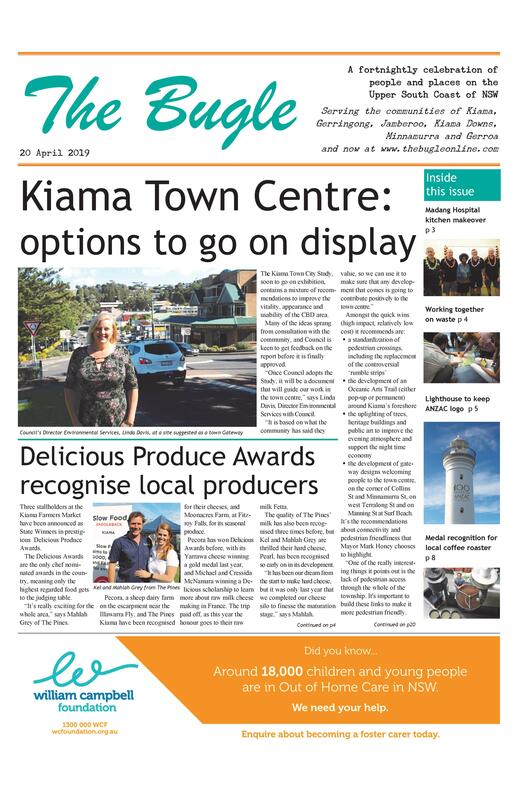 “Unfortunately, it appears that residents will have no say in the formation of the Kiama Town Plan brief, that will set the future development of Kiama for the next 10-20 years, as it has been labelled an operational matter,” Mr O’Neill says. “As the brief will detail what the consultant can and can’t review and will set the stage for the future development of central Kiama, this should be regarded as a strategic document and the community should be allowed to comment on the draft brief. “At the moment, we have been told that “…. at the appropriate time in the future we would welcome the opportunity to discuss the study with community members”. “In other words, once the study has been written and presented to Council we will be allowed to discuss it! It is hard to tell just one side of a major story like this, but with Council in lock-down over the matter we are unable to do more. Mr Daoud has shown The Bugle documentation to back his assertions. It is a story we will continue to follow with great interest.